The Association of Fundraising Professionals (AFP) has been the standard-bearer for professionalism in fundraising for the past 50 years. Members throughout the world advance philanthropy by enabling people and organizations to practice ethical and effective fundraising by providing education, training, mentoring, research, credentialing and advocacy. 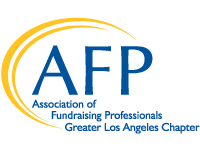 The purpose of the AFP Greater Los Angeles Chapter’s Partners in Philanthropy (PIP) program is to provide companies, foundations and individuals the opportunity to invest in a year-round marketing strategy while enhancing the level of expertise of fundraising professionals in the greater Los Angeles area. In addition, partnership opportunities underwrite scholarship opportunities for professionals who cannot afford to attend development seminars and conferences. All Partners’ names will be advertised on the AFP GLAC website, in related printed materials distributed at various events and announced at the Chapter Education sessions, Area Roundtable or Regional Philanthropy Conference. National Philanthropy Day® is celebrated nationwide each November. Our event attracts more than 400 executive directors, development officers, board members and fundraising professionals from nonprofits throughout the LA area. Our Regional Conference serves to educate attendees on various fundraising topics and inspire creative collaborations through networking and exhibition resources. The purpose of the Awards Luncheon is to recognize the excellence and achievements of individuals in the Los Angeles philanthropic community. Four Chapter Education Luncheons are held throughout the year (February, May, September and December) at the Cathedral in downtown Los Angeles. Over 100 executive directors, development officers, board members and fundraising professionals attend these informative sessions to advance fundraising expertise and opportunity to network amongst AFP GLAC chapter members. Sponsorship includes one skirted table top located across from registration, logo in event email invitation, logo on event registration page, logo in monthly newsletter, 2 minute session presentation, 1 lunch seat at President’s table and recognition from podium. Our Advanced Executive Forums are held in April and August. These events attract 50-75 senior level fundraisers from the Greater Los Angeles area. Our Young Professional educational events are held in March and June. The YP events host between 30-40 attendees as an opportunity to expand the professional development for young individuals in the philanthropic community. These networking educational luncheon sessions are held three times throughout the year (January, July and October) in San Gabriel Valley and Downtown Los Angeles. There are 25-40 development leaders and fundraising professionals at each round table event. Sponsorship includes logo in event email invitation, logo on event registration page, logo in monthly newsletter, 2 minute session presentation, 1 lunch seat and recognition from podium. To secure your sponsorship today, download the PIP Form here and send to our Chapter Administrator Debbie Even via email at debbie@maplestreet.org. Questions? Please reach out to PIP, Chair, Jennifer Ellspermann via email at jellspermann@komenlacounty.org.